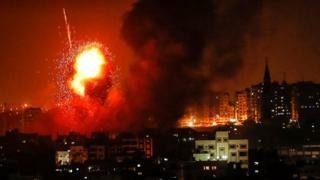 Israel launched strikes on Wednesday after dozens of rockets were fired into Israeli territory by Hamas. Her husband was reportedly injured. A Hamas militant was also killed in one of the strikes, while at least 12 people in Gaza were reportedly injured, health officials said. Israel has not commented on the reported casualties in Gaza yet. The Israel Defense Forces Twitter account said its fighter jets had targeted more 140 strategic sites, including a weapons manufacturing and storage facility.